Preveli Beach - Courtesy © Tony Taylor stock - Fotolia.com Preveli Beach on Crete. Argo Travel News had a chance recently to connect with kayak adventurer Dana Paskiewicz (below), Marketing Director of The Northwest Passage, an adventure travel company that aimed at travel from the North Pole to warm southern waters and beyond. Dana was gracious enough to share her experiences exploring the wonders of Crete from the sea, a not oft discussed vantage point from which visitors can observe the wonders of this fabulous and ancient Island. About 7,000 years ago the primitive people of the Island of Crete began what you might call modern agriculture. About the same time humans formed loose civilizations in Mesopotamia and Egypt, a fascinatingly different people and culture was emerging on this Mediterranean Island. Crete, before it is anything else, is a speck in the crystal azure sea, after all, one that can easily be explored by paddling around its shores. The land of the Minoans, a fabulous place that boasted nearly 100 cities before Europe emerged from the stone age, a place of mystery and still untold history, Crete is not only interesting, but fabulously beautiful. Dana: I first heard of Crete as a premiere spot for kayaking through the company I work for, The Northwest Passage. Twenty-five years ago, our founder Rick Sweitzer traveled to the islands in search of a warm-weather paddling paradise. What he found was the south coast of Crete, Greece. Pristine, isolated beaches, azure, calm waters, picturesque cliffs and mountains, and down-to-Earth Greek hospitality all make Crete the ultimate package when it comes to kayaking the Mediterranean. After leading several kayaking programs there, I have found myself in love with Crete as well, and it is a thrill to share this excitement and passion with others! Like any Island, Crete around its coastline is a far bigger touristic hurdle to conquer than when taken by linear land routes in between spots. Countless beaches, coves, caves and crevaces dot the seascape for anyone sightseeing from the seaward. And imagine the perspective from low on the water, paddling the waves offshore. And too, seeing the Island from this angle is probably how many Minoans and early Crete dwellers pictured their Island home too. You see the Minoans were, in fact the greatest seafarers of the ancient age. Records in Egypt and beyond describe the people from here as the great traders and merchant seamen of antiquity. 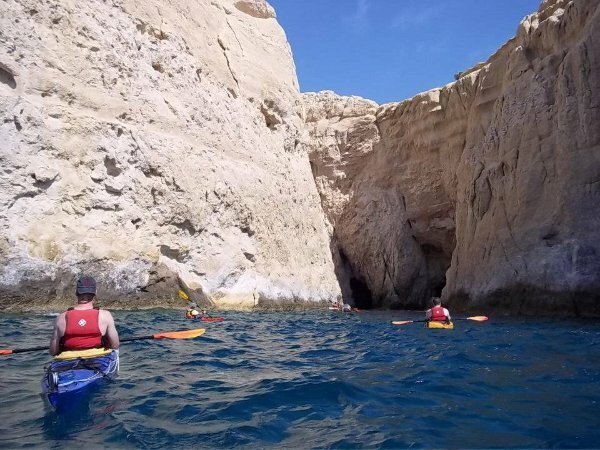 Dana: The waters of the Libyan Sea can be an inviting place for individuals looking to travel by kayak, however, the weather changes frequently, and the inexperienced paddler could find themselves in tricky scenarios if not properly trained and educated. My advice for those interested is simple: choose a guide service that appropriately fits your desires. Touring Crete and the Greek Islands by kayak is an excellent way to visit the lesser-known destinations on the islands, from a vantage point that is alike no other. Traveling with a guide allows for safe, prepared, and experienced travel. There are locations we have frequented for 25 years that are only accessible by boat or foot (and certainly wouldn’t be found on an internet search!) with whom we have established strong relationships. We dine and eat as if we were family. Trust your guide, and you will enjoy a spectacular holiday that is off the beaten path, indeed. For ages Crete has been renown for its climate. Not unlike other arid regions of the world, it’s clear life on Crete is a healthy life. Renown not only for their maritime prowess the Minoans thrived here largely because of the fertility of the place, but also because of its relative seclusion. And agriculture in the Bronze Age was the essences of human endeavor. Famed for olive oil and such byproducts on the one hand, these ancient people traded their products and artistic genius as far away as Israel, Egypt, and beyond to Canaan and of course the Greek mainland. Dana gives us a modern perspective on what kayaking around Crete offers that other spots on the globe might not. I asked here about special characteristics of Crete, when compared to other places to kayak. She gives clues to the old Crete’s lure where sunshine and fertility are concerned. 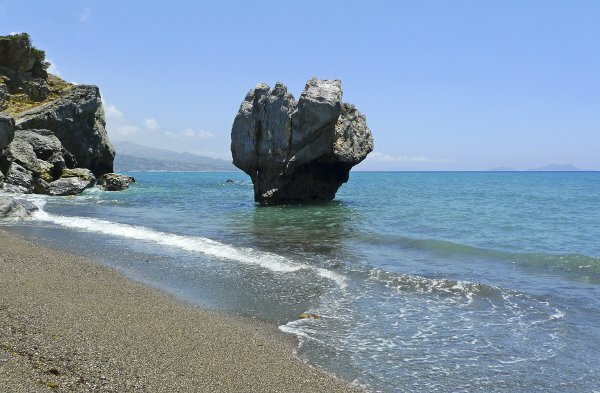 Dana: Crete has a unique climate; it rests between the Mediterranean and North African climate zones, which make air and water temperatures very mild. 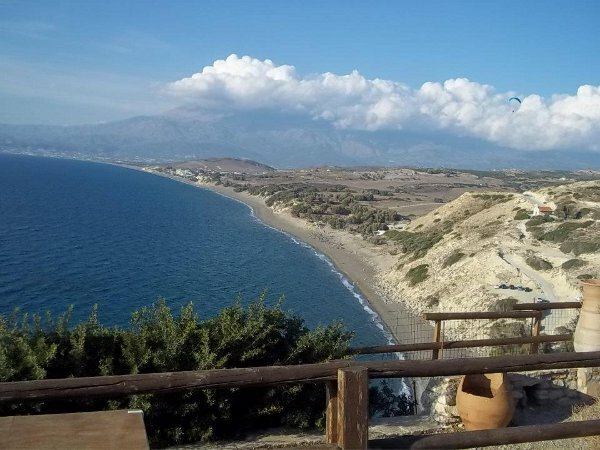 The south coast of Crete is primarily in the North African climate zone, with more sunny days per year than the north end and oftentimes, warmer weather. Aquatic wildlife is also abundant on the south coast, with opportunities to see sea turtles, dolphins, and hundreds of species of fish! From an historic perspective, it’s interesting to note Dana speaks of the dolphins here. The synergy I am trying to create in this interview/article is perhaps best connected via imagery of dolphins as pictured below. 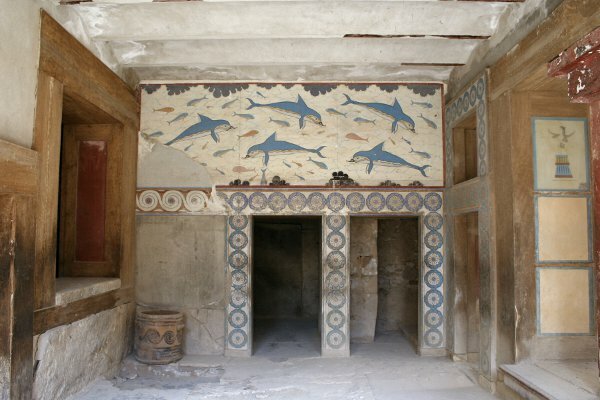 The Sanctuary of the Dolphins at the Palace of Knossos is but one reference to sea life and the links between Cretan peoples on the Island. Like any destination there are always hurdles to overcome, best and worst times to do this or that. I asked Dana about things to avoid when adventuring Crete. 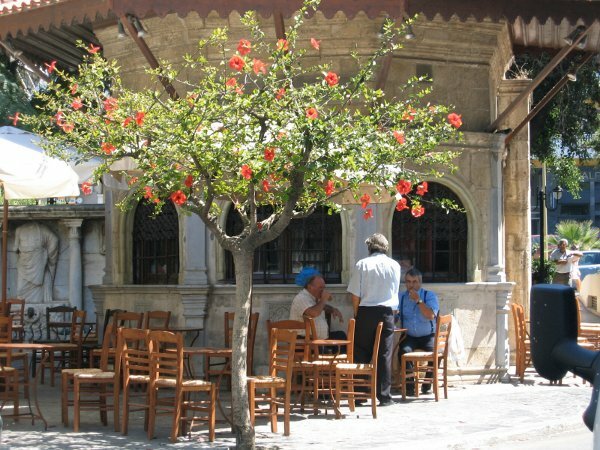 Dana: We have found the best times of the year to visit the island of Crete is spring and fall. Crowds loom in the summer months, and temperatures can be considerably higher (temperatures ranging upwards to 30-40 degrees Celsius). In all our years of traveling the islands, May-June and September-October are the perfect fit. And since the high priestess of Minoan Crete is not still around the ask about “best places” the next best authority other than a local, is someone who explores and actually loves this place. Dana recommends some of the best places to eat, get gear, and so on. Dana on gear and such: My favorite towns to visit are Loutro and Matala – two very different destinations. Both located on the south coast, they are seaside villages with delicious local cuisine, warm hospitality, and kayaking/hiking options. Loutro is a quaint, traditional village accessible by boat or foot travel only. It provides a glimpse into rural Cretan life with white-washed buildings, family-owned tavernas, and ancient ruins that hug the bay side village. 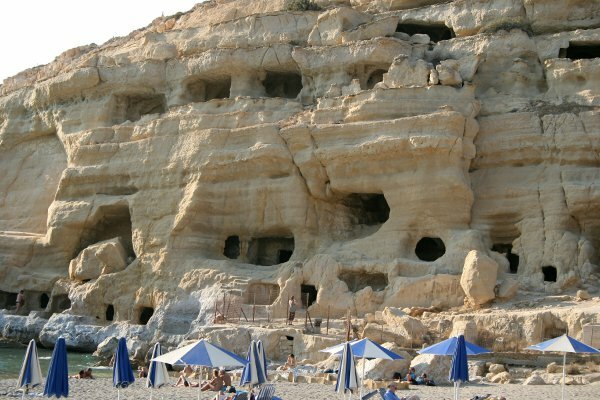 Matala, on the other end of the spectrum, is a seaside town with a bustling nightlife, offering the same great cuisine and hospitality with a flair for partying. Once a popular destination for 1960s greats like Joni Mitchell and Cat Stevens, it was a ‘hippie haven’, a place to get away from the hustle and bustle of the western world. It still has the same great attitude, with laid-back locals, beautiful beaches, and a friendly, artsy vibe. Crete offers so much for travelers to discover. Take a look at the image above. There’s more in that image than at first the eye naturally sees. The modern inhabitants are taking a respite beneath what was a fountain from antiquity. In this manner Crete now blends old and new in fascinating ways. If not for a professor of mine in college, an archaeologist passionate about the Minions and their wondrous civilization, I might not understand more fully the impact this place has had, should have. Looking at the pictures from The Northwest Passage excursions here, I am all the more dedicated to spend some time on that Island. 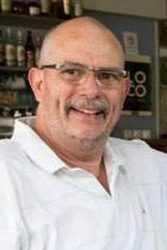 Not many know of the Minoans really, their gold bead work, still unrivaled in the world, the still unsolved Linear A language, inventors of the chariot, the significance of the so called Horns of Consecration, rumors of Thera and Atlantis, 100 other fables and myths this magnificent destination holds. Finally, I leave you with Dana’s overall impression from her times on Crete. I asked about favorites, kayaking or otherwise. 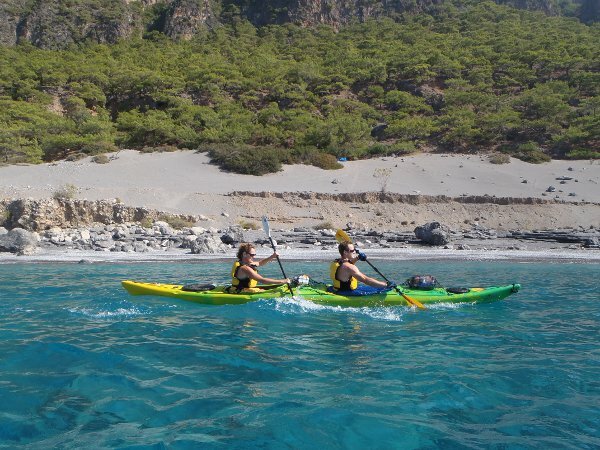 Dana: The entire experience of traveling to Crete via kayak is truly an unforgettable experience. I can’t choose just one aspect of the island to call my favorite – if you’re a fan of warm weather kayaking, ancient culture, fresh food, and outstanding hospitality, I urge you to travel to Crete. You won’t forget it! 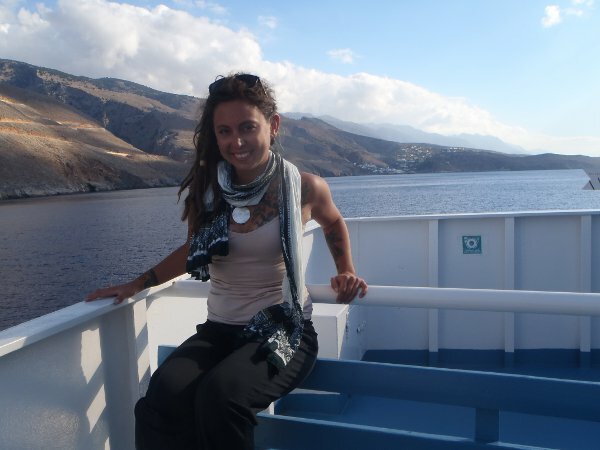 Our thanks goes out to Dana for her insights into unique ways of discovering Crete. We will continue our series on the Island with other experts and locals, along with video and photo coverage. The image of the Map of Minoan Crete below is meant to be a helpful guide for your journey there. We suggest you consult The Human Journey for even more fascinating discoveries.